Date: Why do I feel this gnawing need to chuck the paddle at his head? DaoRisa, mondayclover_pz, MKfan132 and 2 others like this. Looking at this I do feel pitiful for Mae Janward. She has sweet feelings for him, although strongly engineered by both her mum & Date's too. Yet it still stands that she thought they were meant to be together - prior to this he has shown that he prefers her to his given fiancee. DaoRisa, June31sg and maimyang like this. Wow! This thread has reached 1601. My gosh! haven't been here for a long time. Was wondering, the modern drama of Pope and Bella, when will it air? Has it start its filming yet? And what is the title of the drama does anyone knows? Sorry if this question has been asked before. Hello you @chievi4tennis ! Wifey no # 30! We're all waiting, some of the guys have posted ongoing shots of the filming in progress. DaoRisa and chievi4tennis like this. Who doesn’t love salty Date, thanks Rosi for a series of photos. MissPK, DaoRisa, mondayclover_pz and 4 others like this. I think it's not inconsistent. Because as I read somewhere before, all the guys in that time were taught to be flirty. You can see it through Muen Rueng, and other guys. So Por Detch was no different. He treated the ladies with courtesy that included Mea Janward and Mea Mary. All we can see here were some smiles and looks and gentle conversations with no untoward actions or implications. Especially, he's closer to Mea Janward because the families were closed. And she's a beautiful, talented, and respectful lady. What else can we expect him to treat her? If he's really have feelings for her, nothing stopped him from marrying her. Because he can have Janward for first wife, and Kadesurang for second wife and don't care about her at all. He put it on hold for 4 years from the time Karakade arrived. That showed he meant it when he said he just wanted to have 1 only wife. He knew he had to get married with Karakade (because he didn't want to let his father down who's already hurt by his elder brother), but too despised her to carry on. Well, for Karakade, it's another story altogether. MissPK, DaoRisa, June31sg and 1 other person like this. I was thinking the same too, about the play on words that he's never laid serious eyes on anyone before when actually he already had - there's Mae Janward. And with Mae Karakade's been there a year that's just as long as he's liked Janward & hating Karakade. But I guess to him, and also their way of life in Ayutthaya times as long as you like a person but not enough to doggedly pursue until you want nothing but marriage then it's considered "not looking at anyone else with love". Although of course his supposed ties with Karakade because of his Dad's law makes it near impossible to propose to Janward the thing is he didn't think of marriage with her. The mothers think it, yes - so did Janward, but not Por Date. I feel he didn't think that far, only the pressing urgency to not ever marry his evil fiancee. But you know how we girls are right? When someone we love changes his attention to somebody else we don't think of the whys & the reasons behind it, we only feel of the hurts. And that's what happened to Janward, poor girl. DaoRisa and June31sg like this. The only thing I can't really like, which unfortunately is the truth of those times - and also today I suppose - is Pin & Yam's reference to the female servants. That maids of the household is up for the use of the bosses & it's an accepted thing for them to wait for such like Por Date. Seems he's one of the rare ones who don't take up on that offer. DaoRisa, mondayclover_pz and June31sg like this. I can't get over it! Everytime I look at your profile pic I tend to laugh! 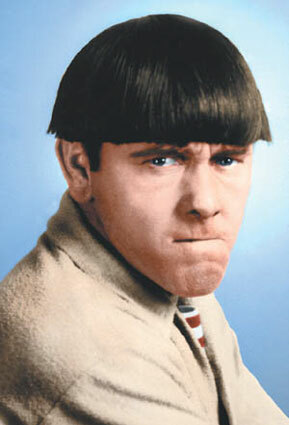 He also looks like Moe from The Three Stooges. DaoRisa, lamchieu, maimyang and 1 other person like this. DaoRisa and maimyang like this. Well, I think Por Date does like Mae Janward, but it is not love he has for her. Unlike the way he feels for the new Mae Karagade. She has the ability to make his heart flutter.... Of cos, he didn't realize it at the beginning. When he insisted to his father that he felt the new Mae Karagade was possessed, his father asked him to look into her eyes. DaoRisa, mondayclover_pz, lamchieu and 1 other person like this. My, you're such the dreamer! haha but that is indeed an apt song. And yes, he did - that moment at the front stairs, his face mellowed right about there ..... he's a great actor with the subtle nuances of his expression it changes a lot we see what's happening to him. He goes from wonder, to being enthralled, and to the point when he turned away he has a satisfied, happy look without realising there's no hate there! But good things do come to an end - his gaze landed on the group behind her & spots most of all Joi's smile. He sort of woke up & retaliated by being his usual ngarly self. So soft his expression looking at Kade. This look of his is the best of all. It's the strong lines of his face - it shows a manly, aloof person whom the real Mae Karakade could never had the chance with, falling in love. Even at this stage he's smiling & happy. Here it's like he came out of a spell. Rachfull, DaoRisa, mondayclover_pz and 2 others like this. mondayclover_pz, lamchieu and maimyang like this. Rosi and lamchieu like this. You really nailed it with these caps @Rosi4 Pope's extremely good with playing expressions. Just by subtle changes on his face, and his eyes spoke volume. His character were not someone who should overreacted in any situation. Like in the scene when Kade was unconscious because of the mon, he couldn't cry the way Pun did, but the single tear he shed shredded my heart. I didn't really see his handsomeness at the beginning but his playing did draw me in and captured me. He's the first and only actor or actress can do that to me. MissPK, June31sg and Rosi like this. MissPK, mondayclover_pz and Rosi like this. It's @phatman and @Rachfull who taught me & since then thanks to them I'm having fun. I very much prefer the ones they both put up though, they're the masters & good at it! And Rach has promised another set, right? We're all waiting! Even if we know she's busy with school. But you too can freeze any video scene you like & then print screen on the keyboard. Most people edit as is, I take the lazy way & pasted it on Paint or Photoshop & crop the edges. Good luck! Rachfull and June31sg like this. I think with BPS you're not the only one who's surprised by the charms of Pope. He's had several productions - and has many loyal fans, but it's as Por Date that he refreshingly delighted again even the most ardent ones, he turned hunk overnight! I too have seen him in a couple of favourites prior to BPS but it's only him as Khun P Muen who takes my heart away. In his other movies he belongs strictly to the heroine but here it's sort of like he belongs to us too. maimyang and Rosi4 like this. MKfan132 and June31sg like this.